Thank you for joining me as we count down to the MFT release. We are just two short days away from the big day! All the new Stamps, Die-namics, and Stencils will be available on Tuesday, June 6 at 9:00 pm EST. Be sure to check out the MFT Blog to see all the new items being revealed today. Don't forget to leave a comment on the MFT Blog countdown posts, YOU could win one of the five $75.00 gift vouchers. Are you ready for a new Shaker Pouch? This month we are releasing the amazing Heart Shaker Pouches that you are going to love! I paired one with the Love Stencil and a few of my favourite Premium Dye Inks, Razzle Berry, Red Hot, and Orange Zest. I filled the shaker with some of the gorgeous diamonds from Queen & Co. 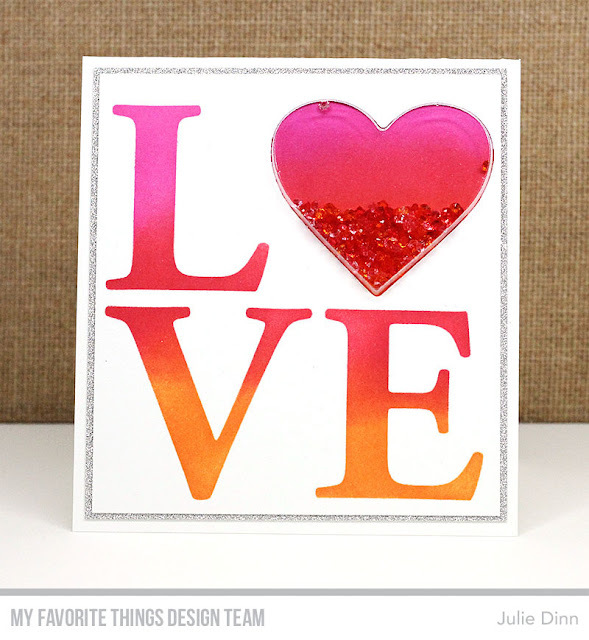 This is such a clever idea and good for MFT for making the stencil and die work together. Wonderful design to your card! All you need is an amazing love heart shaker card! Love this card. That sparkle edge all around and a shaker card too. Fabulous!